NEW ORLEANS — It all comes down to next weekend. The 10 men on the season’s final Bowerman Trophy Watch List – plus, of course, the rest of the national qualifiers – will get one final chance to make their cases to the Bowerman voters at the NCAA Division I Outdoor Track & Field Championships in Eugene Oregon on June 10-13. Wednesday’s Watch List was the final edition before NCAAs and was announced by the Watch List Committee. Trayvon Bromell SO Baylor Sprints St. Petersburg, Fla.
Edward Cheserek SO Oregon Distance Newark, N.J.
Ryan Crouser SR Texas Throws Gresham, Ore.
Marquis Dendy SR Florida Jumps Middletown, Del. All ten men on the last Watch List safely qualified from the first round to the NCAA finals in Eugene; therefore, this Watch List is exactly the same as the last one. For the second straight List, the ten men on it are Shawn Barber, Trayvon Bromell, Edward Cheserek, Ryan Crouser, Marquis Dendy, Deon Lendore, Conor McCullough, Omar McLeod, Michael Stigler, and Maicel Uibo. Though this is the final Watch List of the season, these 10 men are not the finalists. 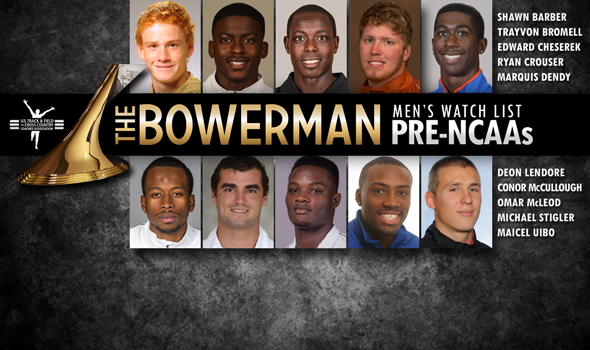 After NCAAs, the Bowerman Watch List Committee announce 10 semifinalists on June 22. Another vote will be held to whittle the field down to three finalists, who will be announced in July. The semifinalists, finalists, and eventual winner will be judged strictly on their 2014-15 collegiate track & field accomplishments, meaning that next week is the final piece of each man’s résumé. If any of them make the IAAF World Championships in August, that won’t help their case; cross country laurels aren’t considered either. Lendore does not get a boost for being the defending winner, and Cheserek gets no extra votes for being a returning finalist. With that in mind, let’s review what each member of the Watch List has accomplished this year and what they will be contesting at next week’s championships. Barber, of Akron, set the pole vault indoor collegiate record, won the NCAA indoor championship, and won the indoor and outdoor MAC titles. Only two things stand between him and a basically perfect season: an outdoor collegiate record and an outdoor NCAA title. His best outdoor mark of 5.91 meters–exactly the same height as his indoor record–is the second best vault in collegiate history. He’ll go for the outdoor vault title on Wednesday, June 10 at 4:00 Pacific time. You can watch him do that on ESPNU. Bromell, of Baylor, false started in the 60 meters and won the 200 meters at the indoor NCAA championships. He won the 200 and took third in the 60 at the indoor Big 12 meet, and won both the 100 and 200 (in addition to a leg on the runner-up 4×100) at the outdoor Big 12 meet. He’ll go for the tough sprint triple in Eugene. All three finals (live on ESPN) are in a ninety-five minute block on Friday, June 12. The 4×1 is at 4:35 Pacific, followed by the 100 at 5:25 and the 200 at 6:10. Bromell is the top seed and defending champion in the 100. Oregon’s Cheserek won the mile, anchored the winning distance medley relay, and took a close second in the 3000 at the indoor national meet; he has competed sparingly outdoors, including a win in the 5000 at Pac-12s. He’ll defend his national title in the 10000 on his home track at 6:43 PM local time on Wednesday, June 10–live on ESPNU–and he’s doubling back in the 5k on Friday, June 12 at 6:30 on ESPN. Crouser, of Texas, took second in the shot put at indoor nationals and won that event at the indoor and outdoor Big 12 championships. He’ll try to defend his shot put outdoor title on Wednesday (5:30, ESPNU) and double back in the discus on Friday (4:05, ESPN3 and ESPN). Like Crouser, Florida’s Dendy is gunning for two national titles in the field next week. He won the long and triple jumps at the NCAA indoor championships and the SEC indoor and outdoor championships. His winning mark of 17.37m (57-0) in the triple jump at indoor nationals is the third best in collegiate history. The Delawarian will try to defend his double outdoor national titles on Wednesday (long jump, 5:15, ESPNU) and Friday (triple jump, 4:30, ESPN). After going undefeated in the 400 meters en route to the Bowerman in 2014, Texas A&M’s Lendore has had a rockier 2015. Lendore dropped out of the indoor SEC championships with an injury, and two weeks later, only took fourth at NCAA indoors. He’s come close to his 2014 form outdoors, though: his winning time of 44.41 seconds at the SEC outdoor meet is only 0.05 seconds slower than his career best that he set at that meet last year. On Friday, June 12 at 6:00 PM PST, Lendore will try to make it two outdoor national titles in a row. He’s also part of Texas A&M squads that qualifed in the 4×100 and 4×400, which are at 4:35 and 6:50 on Friday night. You can watch all of the Friday track action live on ESPN. USC’s McCullough took second in the weight throw at indoor nationals and is the top seed in the hammer heading into outdoor nationals. He’s the third-best collegiate performer ever in the weight throw (24.48m/80-3¾) and seventh best in the hammer (75.88m/248-11). McCullough is the Pac-12 champion in the hammer, which, at 1:30 PM on Wednesday, is the first event of the NCAA championships. It will be live on ESPN3 beginning at 2:00 PM Pacific. Arkansas hurdler McLeod is three for three at conference and national meets in the short hurdles this year. He’s the SEC and national champ – as well as the collegiate record-holder – in the indoor 60 hurdles, and the SEC winner of the 110 hurdles. His winning time of 13.21 seconds at the Drake Relays makes him the No. 5 performer in collegiate history, and his 7.45 second win at indoor NCAAs is the collegiate record. The 110 final will be live on ESPN at 5:15 on Friday evening; he may also run on Arkansas’s 4×1 and/or 4×4, which, as covered above, sandwich the 110s on Friday. Stigler, like McCullough, is seeking his first NCAA title. The Kansas senior is the top seed in the 400 hurdles, which is at 6:00 PM on Friday night on ESPN. His season and career best of 48.44 seconds is just 0.03 seconds outside of the collegiate top ten all-time. Uibo, of Georgia, will aim to defend his outdoor national championship in the decathlon. He took second in the heptathlon at SEC indoors before dropping out of the NCAA indoor heptathlon with an injury; his decathlon score of 8326 points at the SEC outdoor meet makes him the fourth best performer in collegiate history and the highest scorer since former Bowerman Trophy winner Ashton Eaton. The men’s decathlon 1500 is scheduled for 6:28 local time on Thursday night, meaning that it would air live on ESPN. Rodney Brown (LSU), JaCorian Duffield (Texas Tech), and Eric Jenkins (Oregon) all received votes this week. In total, the winners from the award’s first four years have won three Olympic Medals, two World Championships and six World Championships medals. When considering finalists for the award, 13 individuals have earned a combined seven Olympic medals, four World Championships and 17 World Championships medals. CHAMPIONSHIPS HISTORY: How Historic Would an Oregon 1-2-3 5000m Finish Be?